Fifteen of the largest U.S.-based supermarket and grocery store chains have revenues high enough to be ranked alongside the 250 largest retailers in the world. That’s according to the latest 2018 Global Powers of Retailing report from Deloitte Touche Tohmatsu, which is published annually as a global benchmark comparison of the annual revenues of the largest retail chains of all types in the world. In FY2016 (the latest data available), Walmart, Costco, Kroger, Albertson's, and Publix are some of the most well-known supermarket and grocery store chains ranked among the Top 100 retail chains in the world, in terms of annual revenue. But the fact that there are only seven U.S. grocery retailers found among the 100 largest global retailers doesn't really reflect the significance of grocery retailing in the U.S. retail industry. While the U.S. supermarket chain Kroger continues to hold the title of the world's largest supermarket chain in terms of annual revenue, the largest U.S. based retail supermarket and grocery store chains are not as dominant in an overall global retailing comparison as might be expected. One of the reasons why the largest U.S. based retail supermarket and grocery store chains are not as dominant as might be expected is because of the number of hypermarkets like Walmart, Costco, and BJ's in the United States, which are expanding their retail food category. 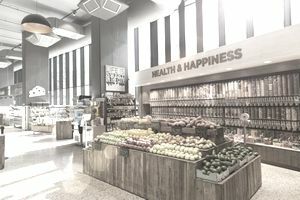 While the largest U.S. grocery retailers such as Kroger, Publix, and Whole Foods are putting smaller and independent grocery retailers out of business, they are not stopping all retail chains from grabbing their piece of the retail food category. While U.S. hypermarket chains, and other global hypermarket chains, may actually sell more groceries than some of the largest supermarket chains on this list, hypermarkets are not included here because their sales of other goods make their revenue figures incomparable to retail chains that primarily sell groceries. Growing grocery retailing competition from hypermarket chains like Target and Walmart, and warehouse chains like Costco and BJ's hasn't stifled the growth of the total number of grocery retailers, which is still growing in the United States year over year. As of December 2018, there are more than 65,691 grocery businesses, according to IBISWorld. So while supermarkets account for a significant part of the U.S. retail industry trade, they are often overlooked because most of the largest national chains are privately owned and not as easily accessible in the mainstream media as other publicly traded retail industry companies. The attempts by mega chains like Walmart to capture a piece of the grocery retailing niche are successfully publicized but not quite as successfully executed. In fact, consumers give Walmart grocery retailing below average ratings compared to other grocery store chains that they rate as having the best customer experiences in U.S. retailing. Publix, Aldi, H-E-B, Trader Joe's (also an Aldi-owned chain) and Hannaford are given high praise and recognition by grocery consumers. One notable change in the grocery landscape has been the Amazon/Whole Foods merger that occurred in 2017. Since then, San Francisco-based Instacart, which used to deliver for Whole Foods, has announced plans to move its in-store shoppers from Whole Foods stores to other retailers such as Publix, Costco, Wegman’s, Safeway, and Sprouts, according to Bloomberg. What follows is a list of the FY2016 largest U.S.-based retail supermarket and grocery store chains, which appears in the 2018 Global Powers of Retailing. The number in the left column represents the revenue ranking of the retail chain, compared to the revenue rankings of the 250 largest retail chains of all types. 29 Publix Super Markets, Inc.
116 Wegmans Food Markets, Inc.